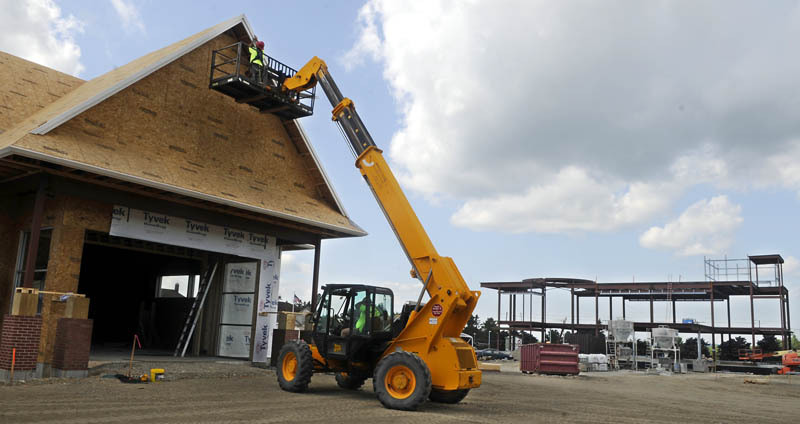 AUGUSTA -- Goodwill Industries plans to hire about 40 new employees to staff its new store under construction just off Western Avenue at the former site of the Kennebec Journal. AUGUSTA — Goodwill Industries plans to hire about 40 new employees to staff its new store under construction just off Western Avenue at the former site of the Kennebec Journal. The 40 new workers would join the 32 who already work at Goodwill’s store at Augusta Plaza, farther east on Western Avenue. Officials anticipate the new store will open in early fall. A new Bangor Savings Bank branch and offices also under construction at 274 Western Ave. is expected to open in February. Another new bank branch, a Skowhegan Savings, is also planned in Augusta, on Civic Center Drive. The 17,000-square-foot Goodwill will be much bigger and more modern than the Augusta Plaza store and will also feature a drive-through donation area. “The drive-through really helps with convenience for our donors,” said Michelle Smith, communications manager for Goodwill Industries of Northern New England. “People will come out and help donors unload. It’s also a larger store, with more windows and natural light. It will have a much bigger area for the shoppers, so we can put more donations out.” It will also have increased hours. Smith said the 32 workers at the current Augusta store will move to the new store when it opens. Goodwill has already hired some of the 40 new workers who will be added to the staff, Smith said, and plans a job fair Aug. 8-9, from 11 a.m. to 7 p.m., at Quality Inn and Suites at 65 Whitten Road in Augusta, to hire the rest. They’ll be seeking full- and part-time, and regular and seasonal employees, including a full-time assistant manager. Goodwill’s building on Leighton Road in Augusta, where it has administrative offices and program space, will remain open when the new store opens, Smith said. The Bangor Savings Bank branch, offices and training center under construction between the Goodwill building and Western Avenue is expected to open in February, according to Yellow Light Breen, executive vice president of the bank. The bank is investing some $3.8 million to build the three-story, 10,000-square-foot building. The new building will bring at least five new full-time jobs to Augusta, in addition to roughly the same number of bank workers at the Bangor Saving Augusta branch on Capitol Street. Breen said the Capitol Street branch will remain open, at least initially, after the Western Avenue location opens. Breen said the new branch will house the branch, offices for commercial and business bankers and underwriters and, on the upper floor, training and meeting space. He said the bank hopes to make the training space available for nonprofit groups to use. Officials of the bank, which has $2.5 billion in assets and 56 branches, said they want to expand in Augusta because the bank has had an increase in accounts and customers from the area. Another bank based north of Augusta also plans a new branch in the city, though its plans still must be approved by the Augusta Planning Board. Skowhegan Savings officials announced Monday plans to build what they describe as a state-of-the-art branch on Civic Center Drive in Augusta, on a parcel of land south of Commerce Drive. When the branch opens, a Skowhegan Savings branch in Belgrade at 940 Augusta Road will be closed, though a drive-up ATM will be installed in Belgrade to serve customers there. The branch is the only bank in Belgrade. Upon completion of the Augusta branch, which is anticipated in March of next year, Meghan Loubier, manager of the Belgrade branch, and her staff will work at the new branch. “The new Augusta branch, only eight or 10 minutes from our existing branch, is highly accessible and convenient for our existing Belgrade customers, many of whom work or shop in Augusta,” John Witherspoon, Skowhegan Savings president and CEO, said in a news release. The developer of the proposed Skowhegan Savings bank site, Elm Street Corporation, is scheduled to go to the Augusta Planning Board Aug. 14 to seek a major development permit. The site is in the planned development district.